Texas Tuesday Continues! 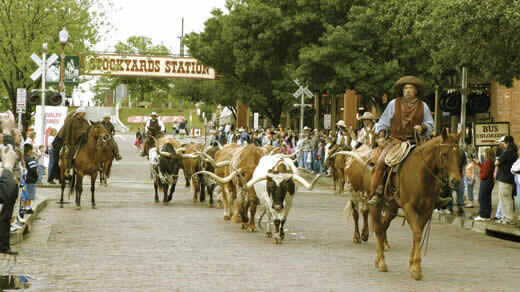 Today we highlight Fort Worth and the historic Fort Worth Stockyards. For many international visitors, a visit to the Fort Worth Stockyards National Historic District epitomizes the Old West image of Texas. On July 25, saddle up for the Fort Worth Stockyards’ National Day of the American Cowboy. This third annual event has been named the best event of its kind in the nation by western lifestyle magazine American Cowboy. Events include the Fort Worth Herd twice-daily cattle drive, Texas Trail of Fame presentations, Texas-size art contest, cowboy celebration parade, rib-eating contest, cowboy karaoke contest and more. Activities will take place along East Exchange Avenue in the Fort Worth Stockyards. For more information, visit www.fortworthstockyards.org. For hotel deals, coupons and a list of free things to do in Fort Worth, visit www.fortworth.com and click on the Summer Stay & Save icon on the lower left-hand side of the page.